Scheduling tweets for future is useful when you have something important to tweet later on during the day and you are not going to be online that time, but want your followers to get that tweet from you. Login to the website using your twitter credentials(the site is not reported as spammy as yet so I chose to share about this site), and in the dashboard you have the option to schedule a tweet. You just need to enter the tweet text, not to exceed 140 characters. Although if its a long URL you are including, don’t worry if it crosses the limit, as Twitter would automatically shorten the URL. Set the time for scheduling the tweet. And then hit “Set Status”, you are done with the scheduling. 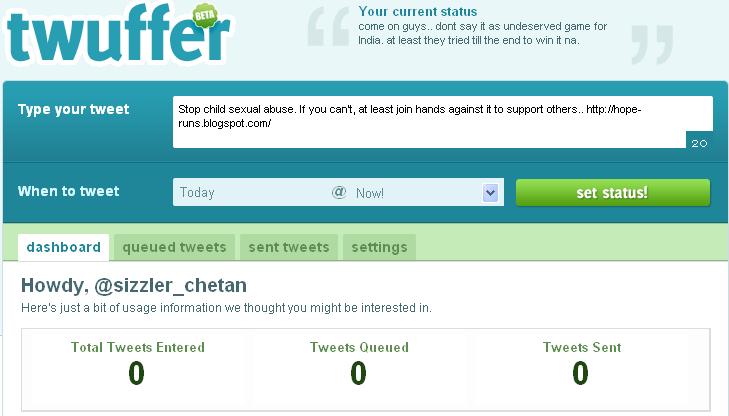 You will see the tweet in the list of Queued tweets. Also, do check that the site has confirmed your time zone correctly, if not, then go to Settings section and set the time zone, the time and date format and select whether you wish twuffer to show your tweets on their homepage or not. 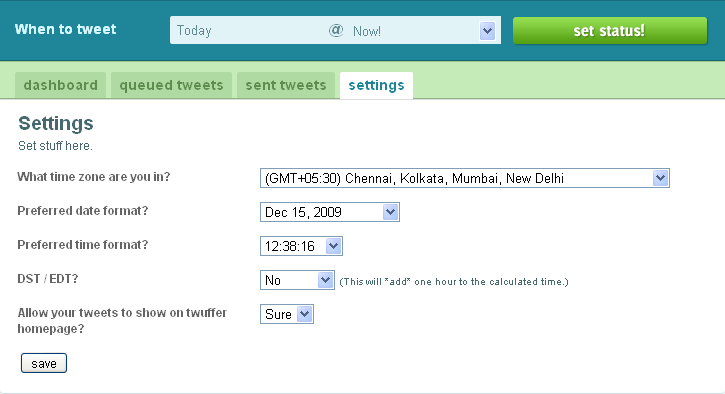 – There are more than 10 more tools for scheduling tweets but for the fastest and easiest way to do that, Twuffer is the best. Wow! “…but for the fastest and easiest way to do that, Twuffer is the best.” We love hearing that. Thanks for checking out Twuffer, and look for an update coming soon! Thanks for the review! We too think Twuffer is the best. Please let us know if you or your readers have suggestions.